March | 2013 | JUDDER! 2006-08-Bring Your Mudda to The Judder! we trust you are keeping well, and are fully rested after our VIDEO GAMES JUDDER last week! You lot properly 1-upped the costumes and were in a real party mood, filling the dancefloor and getting all over our old games consoles from the moment we opened the doors! Huge thanks to Dr. J for guest DJ duties and bringing us 2 slamming sets! Photos are up in the Judder website gallery and on Facebook but I’m sure we missed some of the brilliant outfits, so if you have more photos to share, please send them our way and you could win free entry to the next Judder! 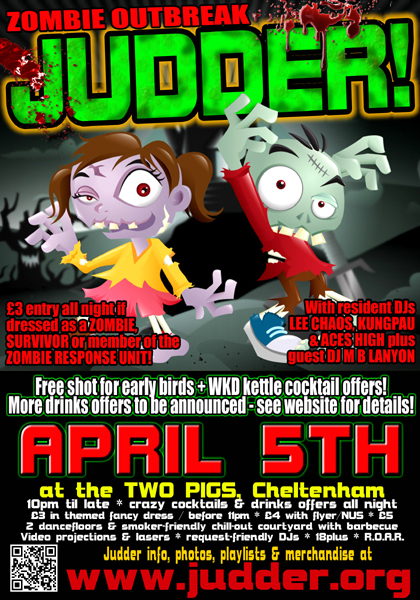 Talking of which, the next date in the diary is Friday 5th May for our ZOMBIE OUTBREAK JUDDER when we predict the dead shall roam the earth once more! Bringing the necromantic beats will be our guest DJ M B Lanyon, there will be free shots for early birds, sweets, treats and surprises aplenty so come and join us to party like the world is about to end! And for those of youwanting to make it into a big weekender, the next day, my electronic A/V band are performing a one-off never to be repeated performance as headliners at the Tempting Failure festival in Bristol which is shaping up to be an unforgettable evening of outsider art and performance. Info and tickets available here. That’s all for now, look forward to seeing you soon, alive or undead!